Google Inbox was supposed to be the future of Gmail. It offered more advanced filtering, snoozing of messages, and more visual organization to the Gmail inbox. As of lately, Inbox users knew that the app was going kaput, but it wasn’t until recently that users are now seeing a more specific shutdown date. 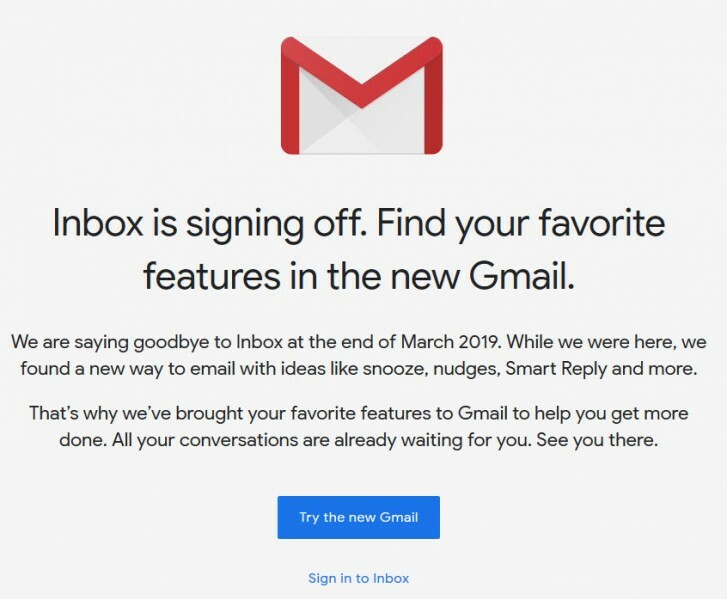 If you head to the Inbox landing page: Google.com/inbox, you’ll be greeted with a message that says “Inbox is signing off”. Find your favorite features in the new Gmail.” Google is going to shut down Inbox at the end of March, and a countdown from the Inbox app ends on April 2. We see the following message when logging into Inbox on a desktop. Although Google did implement some of Inbox’s features into Gmail, it hasn’t brought all of them. Many loyal Inbox users will be upset to learn that some of the more specific features like inline highlighting of actionable links, the option to save links within Inbox, or the ability to archive groups of emails aren’t in Gmail. There is another email client that might gain an enormous amount of users in the next month or so. An iOS-only email client named Spark is going to launch for Android right around the time that Google is set to retire Inbox. This according to the tweets it has been replying to Inbox users on Twitter. Perhaps Spark will be able to fill a void that will be left by Inbox. Are you an avid Inbox user? Which feature from Inbox that’s missing from Gmail will you miss the most? actually google doesn't support those services that are not popular or can be replaced with something better, that's all. they've never outright-discontinued a successful service e.g. Google Talk which had Hangouts as its next iteration.